Reston Now is running Q-and-As with the Reston Association Board of Directors candidates as the 2016 board election begin March. 7. Today’s chat is with April Tan, who is one of three candidates running for the At-Large Seat. Reston Now: What makes you want to serve on the RA Board? 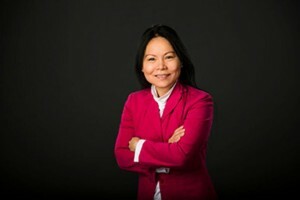 April Tan: As a leader in her career, church and community in New York, my adopted grandmother, Peggy Joyce, taught me about volunteer leadership in the 1980s. When my late father and I moved to Reston in the 2000s, we continued our volunteer leadership with me serving as a Treasurer for the MIT Enterprise Forum, a Board of Director for the Cornell Club and a small business commissioner for Fairfax County since 2009. As a Commissioner, I provide quality leadership, stewardship and service to us residents. I was the only commissioner who asked about the new software system installed in 2009 when Fairfax County bought it during the Great Depression of 2008. Since 1998, I have served professionally on executive teams of nonprofit and for-profit healthcare and financial institutions like Bank of America, Citi and BB&T, with responsibilities for technology, finance, operations and staff; leading to my current responsibilities for the Office of the Secretary of Health and Human Services. In honor of my late father, I am running for an At-Large Board of Director position of Reston Association to give back to Reston my leadership, stewardship and service to family, friends and neighbors like you. RN: What is the biggest issue facing RA right now and do you have an idea to improve it? AT: The biggest issue facing RA is engaging and serving current and future members of several large residential developments with our aging infrastructure. Reston is more than 50 years old. We will need to develop sound strategies to ensure that we are able to maintain, adapt and enhance our existing facilities and programing to meet the needs of our diverse and changing community. We need to look into more non-traditional RA revenue sources like private-public partnership projects with the county, state and federal government; sponsorship from corporations like Real Estate Investment Trusts; and grants from endowment, foundation and government. RN: How can RA members better understand what the board does and how can they be better involved in improving our community? AT: RA members can better understand what the Board does by reading RA materials and media. They can attend Board meetings and give comments. They can contact Board Members to inform them of new development in their community. You can be active in your apartment or cluster governance; talk about RA current events with your family, friends and neighbors. Bring a family member, friend or neighbor to a RA program. Lastly, visit Reston.org for updates. RN: Some of the criticism of RA recently is wasteful spending, lack of transparency and rising assessments. What can be done to improve or at least improve perceptions of all of these things? AT: Take the time to be educated, engaged and be involved by voting, volunteering and attending programs and events. See answers to question No. 3. RN: This is an important time for Reston’s growth as several large residential developments are in the works, and most of the residents will be RA members. What can the board do in the next few years to adequately prepare to serve thousands more people? Will having more members stress RA services? Optimizing member experiences: To optimize the services, programming and facilities offered to RA members. Leading sustainable change: To enhance and protect Reston’s built and natural environments to ensure development and redevelopment is consistent with the Essential Elements of Reston which include environmental stewardship, commitment to the arts, accessibility, planning and design excellence, recreational amenities and housing opportunities. As a current Fairfax County Commissioner, I would ensure that RA is an active, effective participant in the county decisions that impact Reston. Fostering community engagement: To educate and engage our diverse community about RA amenities, programs, services and natural resources. Leveraging technology: To serve members, staff and the community with effective, demand-based technology. Managing competing resources: To manage our resources to best serve RA and our members. See Monday’s chat with Lake Anne/Tall Oaks candidate Sherri Hebert.